If you listen closely, you can almost hear the raucous pounding of mugs to tabletops and “Yo-ho-ho” sing-alongs. Jack Sparrow and the latest Pirates of the Caribbean film have created such a furor that one homeowner in southern Florida has done something of an extreme makeover on his property. 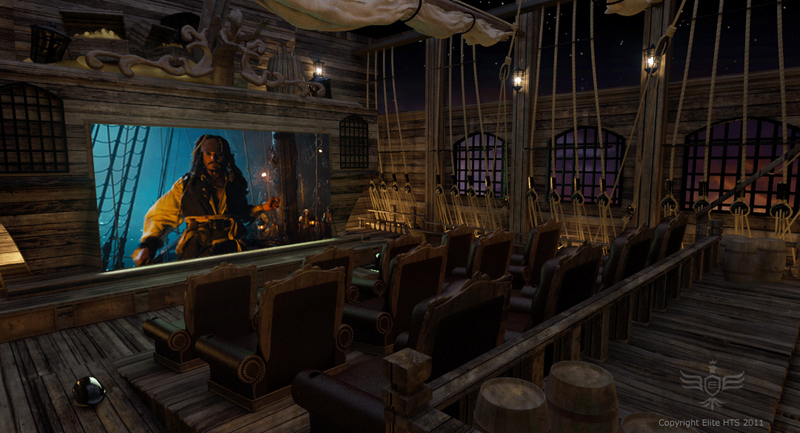 With the assistance of Elite Home Theater Seating, he will be converting a sizeable portion of his residence into a luxurious theater complex intended to harken back to the days of high-seas swashbuckling. 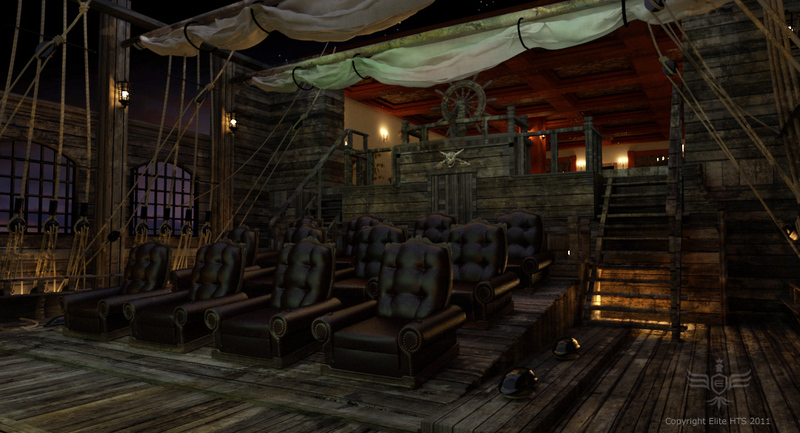 $2.5 million in the making, the complex includes a paved entrance way (complete with ticket booth), a Pirate tavern, and a theater that is situated on the deck of a Pirate Ship—the whole looking as if it were conjured out of Treasure Island. The entrance to the Florida theater will be captivatingly Old World, a cross between a 17th -century drinking hole for the Most Wanted of the High Seas, and a box office. The gas lanterns wink torch-like, casting a faint glow that adds a warmth and dramatic contrast to the heavy, embossed double doors, and the rough-hewn stone of the floor and walls. The hand-painted ceiling canvases simulate a stormy Caribbean sky even though the complex is completely indoors. As one approaches the ticket booth, it isn’t clear whether admission is being gained to an upscale home outside Palm Beach or a 17th-century stockade. The tavern/theater lobby inside the entrance is almost entirely in candlelight, which the heavy dark wood of the bar, tables and chairs, seems to enfeeble. Just the sort of dusky ambiance one associates with fugitives and anonymously greedy rum guzzling, yet so utterly warm and charming as to temper even the most savage soul. “I believe our designers have managed to strike just the right note for the client’s requests which include a room filled with character and soul, yet still warm and inviting.” adds Bala.